When Diego and I went to Amsterdam, we prepared several meals at home with our hosts, Sam and Ine. This recipe is based on a recipe from Sam’s repertoire which we prepared together. These patties are halfway between hamburger patties and meatballs in shape. Dice onion into 1/4″ pieces. Mince garlic in a garlic press or on a grater. Chop bread in 1/4″ dice. Combine all ingredients except olive oil in a bowl. Mix just enough to combine evenly without overworking the meat. 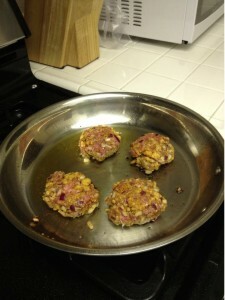 Separate mixture into four patties, about 3 1/2 inches in diameter and 1 inch in thickness. Heat olive oil in a 12″ stainless steel skillet over medium heat. Cook the patties on side until a brown crust forms on the bottom, about 4 minutes. Turn the patties, reduce heat to medium-low, and cover until the patties are done, when an instant-read meat thermometer measures 155°F in the center of the thickest patty. This entry was posted in , recipes. Bookmark the permalink.